Wholesale customers please email for wholesale prices. 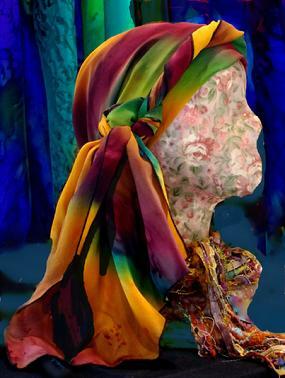 Silk artist Helen Glidden lives in rural Idaho where she creates hand painted Silk designs in her home studio. Each Silk piece is individually painted assuring you are purchasing an original piece of wearable art. The Silk starts white. It is then stretched on a frame in preparation for painting. 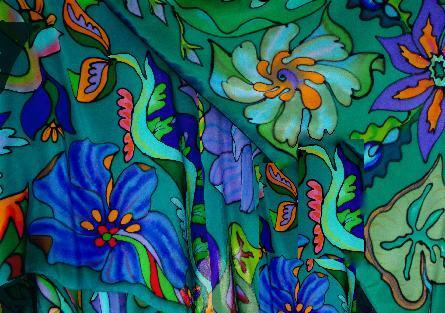 Helen uses high quality professional Silk dye from Paris, France. The dye is painted onto the Silk with brushes. The salt dye effect is made by applying a special Silk salt to the fabric while the dye is wet. There the salt and dye react to form blending and flowing color designs. The designer (pictoral) art is painted onto the Silk with Sumi brushes after the design is outlined with resist which keeps the color contained within each design area. The Silk is processed in a steamer to set the color. This process takes up to 4 hours. After steaming each Silk piece is machine washed with a special detergent that lifts out excess dye. The Silk is then pressed. Each piece is machine washable using a mild soap followed by tumble drying. The finished Silk is very durable, easy to clean, and wrinkle resistant. The color is non-toxic to the wearer and is quite color fast.